There's a new vulnerability in town... "The new bug, dubbed LogJam, is a cousin of Freak. But it’s in the basic design of TLS itself, meaning all Web browsers, and some email servers, are vulnerable." According to the article, "Internet-security experts crafted a fix for a previously undisclosed bug in security tools used by all modern Web browsers. But deploying the fix could break the Internet for thousands of websites." We're starting to see news coverage from other outlets, and we're sure more analysis will emerge. However, at this time your best source for more information on this bug is at weakdh.org. 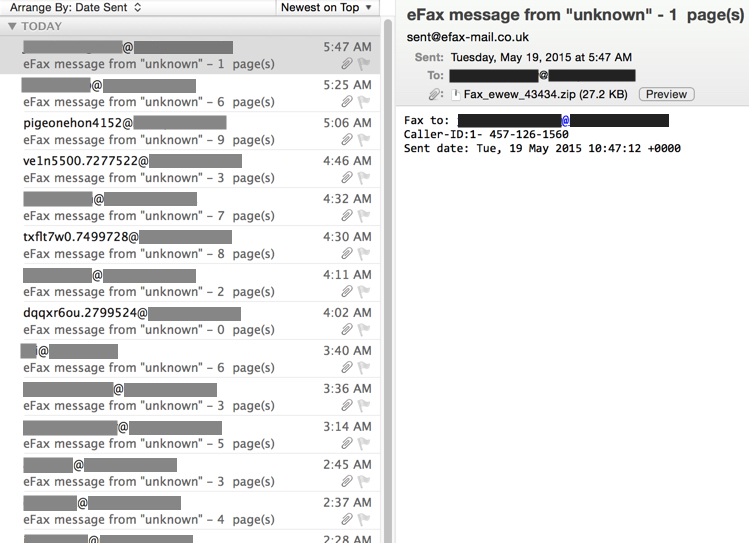 Upatre/Dyre malspam - Subject: eFax message from "unknown"
Yesterday on 2015-05-19, I attended a meeting from my local chapter of the Information Systems Security Association (ISSA). During the meeting, one of the speakers discussed different levels of incident response by Security Operations Center (SOC) personnel. For non-targeted issues like botnet-based malicious spam (malspam) infecting a Windows host, you probably won't waste valuable time investigating every little detail. 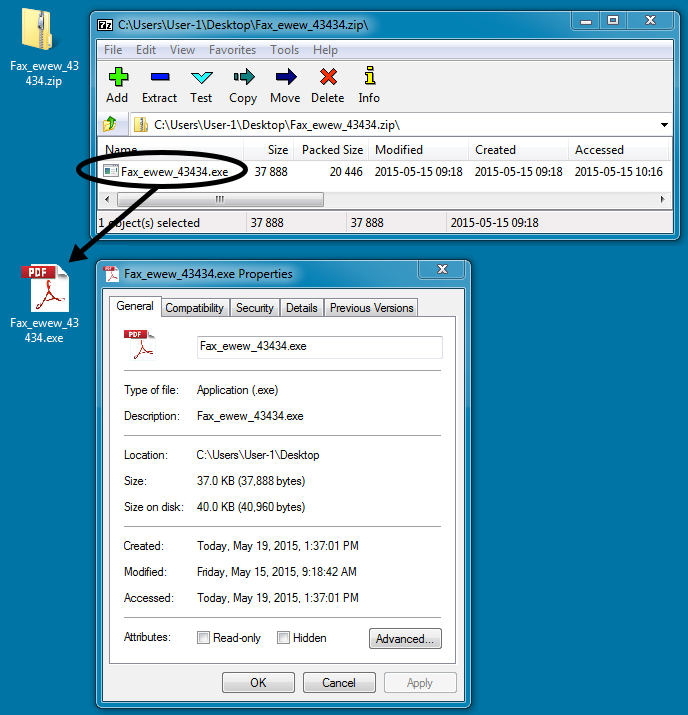 In most cases, you'll probably start the process to re-image the infected computer and move on. Other suspicious events await, and they might reveal a more serious, targeted threat. However, we still recover information about these malspam campaigns. Traffic patterns evolve, and changes should be documented. As shown in the above image, these messages were tailored for the recipients. You'll also notice some of the recipient email addresses contain random characters and numbers. Nothing new here. It's just one of the many waves of malspam our filters block every day. I reported a similar wave earlier this month . Let's look at the malware. The attachment is a typical example of Upatre, much like we've seen before. Let's see what this malware does in a controlled environment. In my last post about Upatre/Dyre, we saw Upatre-style HTTP GET requests to 91.211.17.201 but no HTTP response from the server . That's been the case for quite some time now. However, in this example, the infected host attempted a TCP connection to 91.211.17.201, but the connection was reset after the initial SYN packet, and an HTTP GET request was never sent. How can we tell this is Upatre? The malware checks for an IP address, and header lines in the associated HTTP GET request fit the pattern for Upatre. As I've mentioned before, icanhazip.com is a service run by one of my fellow Rackspace employees . By itself, it's not malicious. Unfortunately, malware authors use this and similar services to check an infected computer's IP address. What alerts trigger on this traffic? See the image below for Emerging Threats-based Snort events on the infection traffic using Security Onion. This was yet another wave of Upatre/Dyre malspam. No real surprises, but it's always interesting to note the small changes from these campaigns.